Award Badges Going Live Soon! Message boards : News : Award Badges Going Live Soon! Hello Crunchers! We've been throwing around the idea of creating profile badges here at MilkyWay@home for a while now, but we seem to always have a more mission-critical problem to solve (coding, science, etc.) - until now! In the image below, you will find all of the badges that we will be rolling out in the next few days! 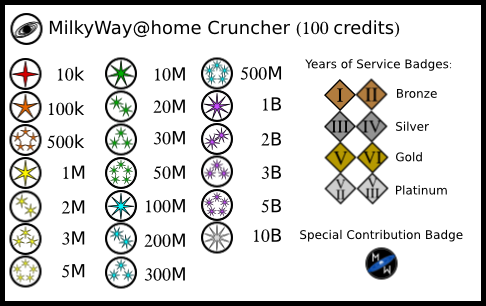 "Joined MilkyWay@home": This badge is awarded to everyone who crunches at least one work unit for our project, as a Thank You for helping out! "Credits Earned": This badge represents the latest credit milestone that a user has passed, ranging from 10,000 (10k) to 10 billion (10B). "Special Contribution": This badge goes to anyone who has donated hardware, money, significant expertise, or service towards the project. I will be building a webpage that describes these badges. Originally, I wanted to do a "Cosmic distance milestones" badge system, but I didn't have enough space to work with - So I'll put those milestones on the description page instead! We hope that you'll enjoy the badges! You should have badges for 2M, 3M and 4M. 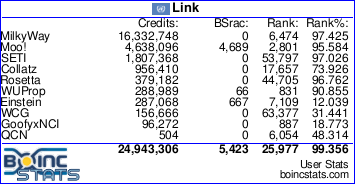 To go from 1M to 5M between badges is a bit much. My laptop is on 24/7 and only crunches 0.5M stones a year. So it will take roughly 8 years to go from 1 badge to the next! Also what is to stop anyone registering and doing one work unit and never crunching again. they will see their levels of service badges increase without really earning them. You should only award service badges to anyone who completes a certain number of units per year or better still they have to crunch units on a certain number of days per year. I take it that 50k should read 50M? Message 60579 - Posted: 14 Dec 2013, 9:59:07 UTC - in response to Message 60571. Message 60580 - Posted: 14 Dec 2013, 11:42:57 UTC - in response to Message 60579. I kind of like both, some pc's are REALLY, REALLY fast while others are REALLY, REALLY slow, to accommodate the slow ones units per year would suffice, but if a fast one did the same number of units in 3 months should that also constitute a year? So maybe x number per month would cover both, but use a sliding scale, so the slow pc's are not penalized, and the fast pc's are not over compensated as in doing 25 units in 3 days and calling that enough for that month. But maybe 25 units is all a slow pc can do in a month, do you really want to exclude people just because they can't buy new hardware? Other then that I LOVE the new badges and think they are a great idea and addition!! Will the badges be retroactive for work done up to now? And can we have the badges also show up on our Teams list so that we can see how we match up to each other? Some of the other badge projects do this. I think too the 1 credit badge shouldnd activaded to prevent "fake accounts". - I updated the image so that it properly reads "50M"
- I'll look into adding smaller incremental badges at "lower" levels - such as 2M, 3M, 20M, etc. badges. It does make sense to have them. - I would like the time badges be valid only if the account has been actively crunching for that long, but this is a tricky thing to measure. If we are too lax, there will be ways to "game" the system, and if we are too strict, some deserving users may be cut out. I'm thinking that the time badges should only display if a user's current RAC > 0? - I'll move the 1 credit badge up to 100 credits; that should be 1-2 WUs. I'm ok with "fake accounts" having the badge as long as they've done something towards the project. - All badges will be retroactive. Message 60614 - Posted: 17 Dec 2013, 15:28:25 UTC - in response to Message 60609. For Science and Shrubberies! Since January 13 2000. Message 60627 - Posted: 19 Dec 2013, 22:26:10 UTC - in response to Message 60614. Travis should provide an ETA for implementation soon. We're looking into other ways to make it work, but we need to dig around the database a bit and see what data we have available. Happy Holiday season to all of you! 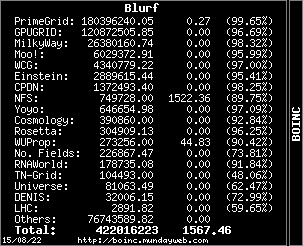 A proposal for retroactive time badeges: maybe you can estimate based on the credits the time needed - at WCG I see about 40k-45k BOINC cr/90 days for all subprojects for my configuration. The time required is for sure depending on the cpus, but that may be available from your database. Is it possible to include a badge to indicate a CPU contribution of 50%/75%/100% to a participants contribution to the project? Message 60660 - Posted: 28 Dec 2013, 16:13:10 UTC - in response to Message 60655. This might work for CPU-only projects (doubt that actually, unless the project is very new), but the difference in processing time between CPUs and GPUs here is too big. Also it does not make sense to consider just the current machines sombody is running the project on, he or she might have started with a lot slower ones (my first Milkyway WUs were done on a AthlonXP 2000+ for example). Message 60662 - Posted: 30 Dec 2013, 12:35:45 UTC - in response to Message 60661. A pure guess would be a couple of days, but I have seen dates being given for software releases in the past that when missed catch holy heck, EVEN when they said it was a pure guess. I think alot of places are less and less likely to give firm dates. Even the new Xbox One and PS4 had to be updated right out of the box prior to being first used, and they were announced months in advance. Message 60693 - Posted: 6 Jan 2014, 23:30:35 UTC - in response to Message 60662. I just returned from my holiday vacation, so I'll be getting on this again. Message 60701 - Posted: 7 Jan 2014, 22:05:38 UTC - in response to Message 60693. A question more relevent for 2016 but will you be adding badge pairs for extened years of service after platinum? or adjusting the service ranges for (bronze),(silver),(gold),(platinum) in the future?